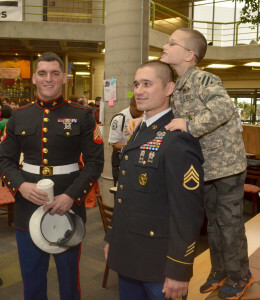 Former Staff Sergeant Kirill Pavlov (right), shown here with his eight-year-old son, Alexander, spoke at the Veterans Day ceremony held at Lawrence Technological University on Nov. 11. A 10-year Army veteran who served in Iraq and Afghanistan, Pavlov is majoring in mechanical engineering. Lawrence Technological University ranked 18th in the 12-state Midwest region – and first in Michigan – in the inaugural ranking of the best colleges for veterans compiled by U.S. News and World Report. LTU was one of 234 colleges nationwide that scored well for graduation rate, faculty resources, reputation and other markers of academic quality measured in the 2014 edition of U.S. News Best Colleges. To qualify for the new rankings, the colleges also had to be certified for the GI Bill and participate in the Yellow Ribbon Program, two federal initiatives that help reduce the cost of college for veterans. Another requirement was membership in the Servicemembers Opportunity Colleges Consortium, a group that works to simplify credit transfers and give veterans credit for military training. In addition, LTU offers a 15 percent tuition discount to all active, inactive, reserve or retired military. LTU is also on the 2014 Military Friendly Schools list compiled by Victory Media, the publisher of G.I. Jobs magazine. The list honors the top 20 percent of colleges, universities and schools that are doing the most to embrace America’s military service members, veterans and military spouses as students and to ensure their success on campus. Almost 100 veterans take courses at LTU during an academic year, including Kirill Pavlov, a mechanical engineering major who is a 10-year Army veteran. He has been impressed by the services provided by Norma Julka, LTU’s financial aid and veteran affairs coordinator. “Norma is amazing. She takes care of everything,” Pavlov said. Helping veterans obtain a college degree is an important mission at LTU, according to Lisa Kujawa, assistant provost for enrollment management. “These men and women have risked their lives to defend the freedoms that we all enjoy. We want to do everything we can to help them prepare for productive careers,” she said.